(CN) – Thousands of legislative fruits of labor born from bargaining and negotiating between lawmakers and lobbyists go into effect across the nation Jan. 1. As usual, significant new 2018 laws addressing topics such as recreational marijuana, immigration and election reform are matched by odd and perhaps trivial bills. In 2018, the Golden State officially goes green. California voters approved Proposition 64, allowing adults over 21 to buy up to an ounce of recreational pot from permitted, legal retailers. Officials predict a regulated weed industry will pad the state’s coffers and reduce drug arrests. While many cities and counties have banned or are still mulling guidelines for local sales, retailers in cities such as Oakland, San Diego and San Jose will be open in January. 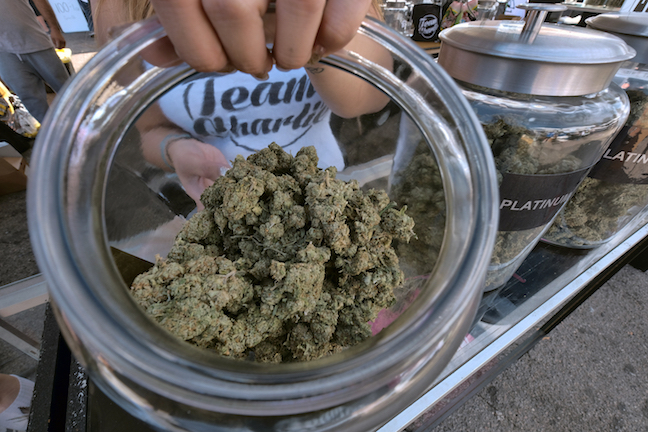 California regulators are still considering how to provide banking services for cash-heavy cannabis businesses that will be shunned by most banks. Nevada and Massachusetts also approved recreational marijuana, while Maine Gov. Paul LePage vetoed a legalization measure that was narrowly passed by voters. With the future of a federal program that protects nearly 800,000 young immigrants from deportation in limbo, California lawmakers passed a series of new immigration laws in 2017. Senate Bill 54, known as the sanctuary state bill, was enacted to counter Trump’s controversial immigration orders. The legislation – called a “threat to public safety” by U.S. Attorney General Jeff Sessions – limits local and state law enforcement agencies’ cooperation with federal immigration authorities. Separate legislation prevents landlords from outing or reporting undocumented renters, prohibits employers from cooperating with immigration raids without a warrant and creates safe zones near schools, courts and hospitals. California will shine light on who is paying for political advertisements in 2018 under Assembly Bill 249. Digital content will include the text “Who funded this ad?” and will link to a website disclosing the true donors. California is also piloting a program that will eliminate local polling places in five counties and instead send ballots to registered voters through the mail. Voters will be able to drop off their ballots at designated locations up to four weeks before election day. Texas is moving forward with a new voter ID law that critics claim is likely to disenfranchise many minority voters. Senate Bill 5 requires voters to show a government-issued photo ID or sign an affidavit citing a “reasonable impediment” as to why they could not get an ID in time to vote. A federal judge struck down the law in August but the order was later stayed by the Fifth Circuit. Oral arguments were heard in December and the Trump administration supports the updated voter ID bill. Low-wage earners in populous states like New York and California will see raises in 2018. The statewide minimum wage in areas outside of New York City will increase to $10.40 per hour, while California businesses with over 26 employees will begin paying their workers $11 per hour. Most Empire State workers will also qualify for eight weeks of paid family leave. The law, which will increase to 12 weeks of leave by 2021, makes employees eligible to receive 50 percent of their average weekly leave while caring for sick relatives or a newborn. Beginning in 2018, California employers will not be able ask applicants how much they made at prior jobs and small businesses will also have to guarantee up to 12 weeks of paid family leave to employees. In a move applauded by the LGBTQ community, California will join Oregon as the only states to allow residents to be identified by a nonbinary gender marker on their driver’s license and becomes the first to allow a third option on birth certificates. The measure also changes state law to allow people to apply for gender changes without providing judges with proof of undergoing gender transition treatment. Californians may now cross the street in a crosswalk with a flashing red hand signal without fear of a jaywalking ticket under Assembly Bill 390. Drivers will see a new $25 to $175 fee on their vehicle registrations depending on the value of their vehicle. The fee was included in a contentious $5.2 billion transportation tax increase approved by the Legislature and Gov. Jerry Brown in April. Opponents are circulating a petition to repeal the so-called gas tax via statewide vote. Uber and Lyft drivers must observe the same heightened standards on drunken driving as other commercial drivers, and will be subjected to a blood alcohol limit of .04 percent. The nation’s most populous state will adopt an official dinosaur in 2018. Brown approved a bill naming Augustynolophus morrisi, an herbivore whose remains have only found in California, as the state dinosaur. Lawmakers also declared the walnut, almond, pistachio and pecan as official state nuts.